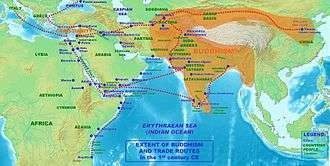 Extent of Buddhism and trade routes in the 1st century AD. 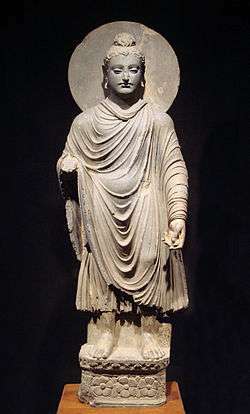 Several instances of interaction between Buddhism and the Roman world are documented by Classical and early Christian writers. Strabo also states that Nicolaus of Damascus in giving the details of his tomb inscription specified his name was "Zarmanochegas" and he "immortalized himself according to the custom of his country." Cassius Dio (Hist 54.9) and Plutarch cite the same story Charles Eliot in his Hinduism and Buddhism: An Historical Sketch (1921) considers that the name Zarmanochegas "perhaps contains the two words Sramana and Acarya." HL Jones' translation of the inscription as mentioned by Strabo reads it as "The Sramana master, an Indian, a native of Bargosa, having immortalized himself according to the custom of his country, lies here." These accounts at least indicate that Indian religious men (Sramanas, to which the Buddhists belonged, as opposed to Hindu Brahmanas) were circulating in the Levant during the time of Jesus. By the time of Jesus, the teachings of the Buddha had already spread through much of India and penetrated into Sri Lanka, Central Asia and China. They display certain similarities to Christian moral precepts of more than five centuries later; the sanctity of life, compassion for others, rejection of violence, confession and emphasis on charity and the practice of virtue. Will Durant, noting that the Emperor Ashoka sent missionaries, not only to elsewhere in India and to Sri Lanka, but to Syria, Egypt and Greece, speculated in the 1930s that they may have helped prepare the ground for Christian teaching. Ashoka ascended the throne of India around 270 BC. After his conversion to Buddhism he dispatched missionaries to the four points of the compass. Archeological finds indicate these missions had been "favorably received" in lands to the West. Ptolemy II Philadelphus, one of the monarchs Ashoka mentions in his edicts, is recorded by Pliny the Elder as having sent an ambassador named Dionysius to the Mauryan court at Pataliputra: "India has been treated of by several other Greek writers who resided at the courts of Indian kings, such, for instance, as Megasthenes, and by Dionysius, who was sent thither by Philadelphus, expressly for the purpose: all of whom have enlarged upon the power and vast resources of these nations." Records from Alexandria, long a crossroads of commerce and ideas, indicate that itinerant monks from the Indian subcontinent may have influenced philosophical currents of the time. Roman accounts centuries later speak of monks traveling to the middle east, and there is mention of an embassy sent by the Indian king Pandion, or Porus (possibly Pandya), to Caesar Augustus around 13 AD (see Pandion Embassy section above). Meanwhile, the Buddha's teachings had spread north-west, into Parthian territory. Buddhist stupa remains have been identified as distant as the Silk Road city of Merv. Soviet archeological teams in Giaur Kala, near Merv, have uncovered a Buddhist monastery, complete with huge buddharupa. Parthian nobles such as An Shih Kao are known to have adopted Buddhism and were among those responsible for its further spread towards China. 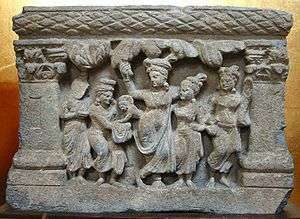 The birth of Siddhartha Gautama, Gandhara, 2nd–3rd century AD. "Thus philosophy, a thing of the highest utility, flourished in antiquity among the barbarians, shedding its light over the nations. And afterwards it came to Greece. First in its ranks were the prophets of the Egyptians; and the Chaldeans among the Assyrians; and the Druids among the Gauls; and the Sramanas among the Bactrians ("Σαρμαναίοι Βάκτρων"); and the philosophers of the Celts; and the Magi of the Persians, who foretold the Saviour's birth, and came into the land of Judaea guided by a star. The Indian gymnosophists are also in the number, and the other barbarian philosophers. And of these there are two classes, some of them called Sramanas ("Σαρμάναι"), and others Brahmins ("Βραχμάναι")." The story of the birth of the Buddha was also known: a fragment of Archelaos of Carrha (278 AD) mentions the Buddha's virgin-birth, and Saint Jerome (4th century) mentions the birth of the Buddha, who he says "was born from the side of a virgin". Queen Maya came to bear the Buddha after receiving a prophetic dream in which she foresaw the descent of the Bodhisattva (Buddha-to-be) from the Tuṣita heaven into her womb. This story has some parallels with the story of Jesus being conceived in connection with the visitation of the Holy Spirit to the Virgin Mary. ↑ Charles Eliot. Hinduism and Buddhism: An Historical Sketch vol 1. Curzon Press, Richmond 1990. ISBN 0-7007-0679-8 p 431 fn 4. ↑ 1. Will Durant, The Story of Civilization: Our Oriental Heritage, Part One (New York: Simon and Schuster, 1935), vol. 1, p. 449. Keown, Damien (2003). Dictionary of Buddhism. Oxford University Press. ISBN 0-19-860560-9. Linssen, Robert (1958). Living Zen. New York: Grove Press. ISBN 0-8021-3136-0. Adamson, John; Musée Guimet (Paris) et.al. (2001). National Museum Arts asiatiques- Guimet (in French). Paris: Réunion des musées nationaux Nationaux. ISBN 2-7118-3897-8. OCLC 469081697. McEvilley, Thomas (2002). The Shape of Ancient Thought. Comparative studies in Greek and Indian Philosophies. New York: Allworth Press. ISBN 1-58115-203-5. The Times Atlas of Archeology. London: Times Books Limited. 1991. ISBN 9780723003069. OL 7865163M. Eliot, Sir Charles. Japanese Buddhism. ISBN 0-7103-0967-8. Eliot, Sir Charles. Hinduism and Buddhism: An Historical Sketch. ISBN 81-215-1093-7. Errington, Elizabeth; Cribb, Joe, eds. (1992). The Crossroads of Asia: transformation in image and symbol in the art of ancient Afghanistan and Pakistan. with Maggie Claringbull. Cambridge: Ancient India and Iran Trust. ISBN 0-9518399-1-8. OCLC 27386749. OL 1482548M.